By Felicia Greiff . Published on April 07, 2015. Rudolph "Rudy" Perz, creator of the Pillsbury Doughboy, died April 1 at the age of 89. Mr. Perz created the lovable doughy character for General Mills while working for Leo Burnett in Chicago. The pudgy icon was introduced as Poppin' Fresh in 1965, appearing in countless commercials and delighting audiences with talk of fluffy pastries and buttery rolls. An Ad Age article about Mr. Perz from 1985. "I worked on almost every account at Burnett," Mr. Perz told Ad Age in 1985, "but I'm most closely associated with the Doughboy--some people say it's the only idea I ever had." In that same piece Mr. Perz also related how close the agency came to going in another direcion, until Leo Burnett cast his vote for Poppin' Fresh. "Leo's turn came and he said the Doughboy was 'one of the hottest things we'd ever done,'" said Mr. Perz. 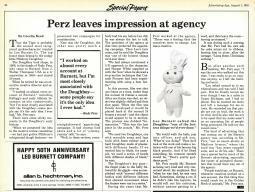 A 1995 Ad Age article called "Bringing Brands to Life" quoted Mr. Perz regarding the effectiveness of advertising the Doughboy on TV. He said TV gave the audience "the picture, voice, character and warmth in one package" in place of the traditional radio and print package. In an Ad Age articled published in 2000, featuring resumes of ad icons, Poppin' Fresh was described as "cheerful, darling, responsive, but non-aggressive." He was named the No. 6 ad icon of the 20th century by Ad Age. A lot of effort went into bringing the famous character to life. According to Taste, General Mill's blog, five bodies and 15 heads were created to make the Doughboy's expressions, and 24 shots were needed to make one second of commercial film. Like any star, Poppin' Fresh changed with the times, appearing as a rapper, rock star, painter and skateboarder in various spots. He even completed the ice bucket challenge and appeared in spots for marketers other than Pillsbury (Geico and California Milk Processor Board). His blue saucer eyes, neck scarf and iconic giggle endeared him to audiences and earned references on TV shows such as "Golden Girls" and "The Simpsons." Mr. Perz's Doughboy, along with ad icons Tony the Tiger, the Keebler Elves and the Jolly Green Giant, will be honored at Chicago's Museum of Broadcast Communications' brand symbol exhibition, "A Salute to Advertising's Greatest Icons." The event starts in May and runs through October 31. Below are some notable spots, including the first Doughboy commercial in 1965, a spot with a rapping Doughboy in 1988 and a Geico spot from last year in which he appeared.